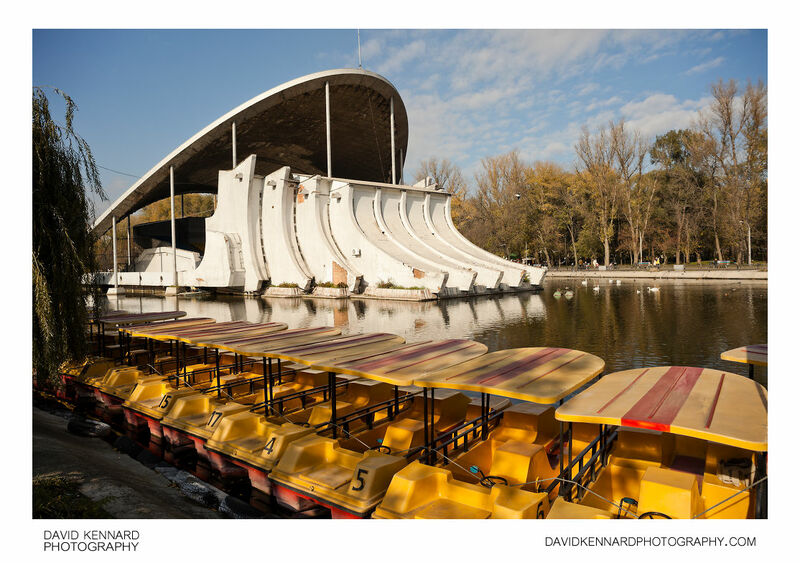 Pedal boats lined up near the Summer Theatre in Globy Park, Dnipropetrovsk. Globy park is a popular park, particularly in the summer, and was previously known as Chkalov park. In the centre it has a large lake. The lake has various leisure boating facilities, along with the Summer Theatre built at the western end, extending out into the water. The Theatre was designed by architect Oleg Petrov, with construction completed in 1978. In the summer various performances and exhibitions are held at the theatre. The design of building is quite unusual, earning it a nickname of "shell". It has become a symbol of Dnipropetrovsk, with its image printed on postcards, magnets, and other souvenirs.